This function will provide you with a very flexible method of defining sales commissions. With 17 different commission codes to choose from and 10 levels for break points, this function will allow you to define almost any kind of commission. 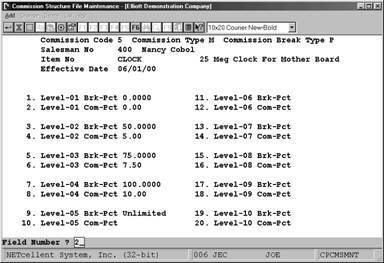 Additionally, you can predefine as many commission codes as you need and specify an effective date for the sales commission. This function is similar to the Elliott Pricing Structure and requires setup procedures, see Global Utilities on this manual. 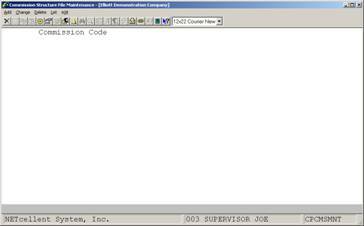 From the COP Maintenance pull down menu, select Commission Structure File. 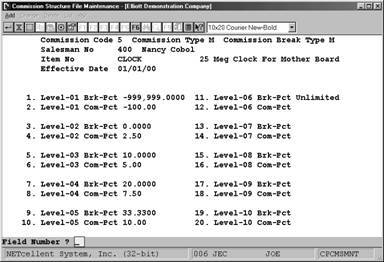 Before using this function, the user should thoroughly review the Salesman Commission Setup examples and explanations to fully understand and appreciate the flexibility and options available in structuring commissions.